Graham worked in Stornaway for a week over 20 years ago for the Health Board. The waterfront hotels are still there and look just as nice but the old hospital has been replaced with a bright, clean, modern version and the place has a confident feel to it. There is a Tesco just next to the ferry, convenient, but not as pretty as the waterfront hotels. 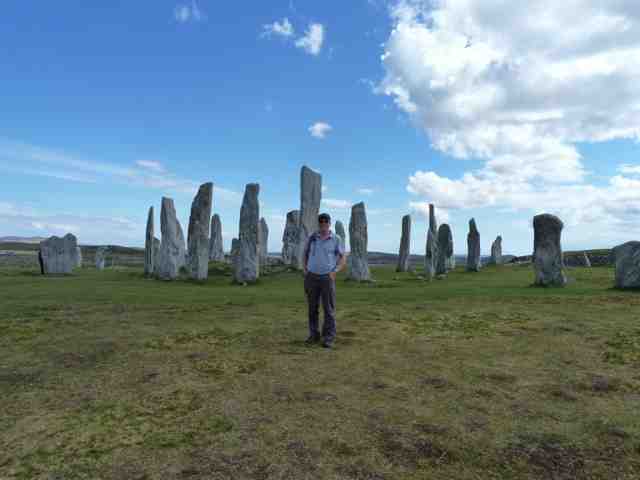 We headed out of Stornaway on the only main road in Lewis towards Harris and made a detour to Calanais to see (according to Lewis tourist guide) Scotland's finest standing stones. 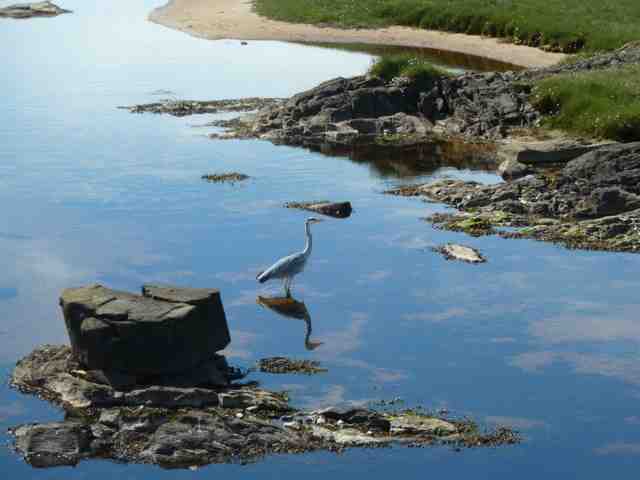 They're situated in a loch side setting on the west coast of Lewis and there are lots of them. There is also a lovely visitor centre in a tasteful traditional looking building with a shop and cafe with stunning views of the loch. The area in north Lewis gives an air of humans taming a wild landscape, with lower lying land providing (once it has been worked) fertile grazing ground until the rock becomes impossible to deal with and is left wild. 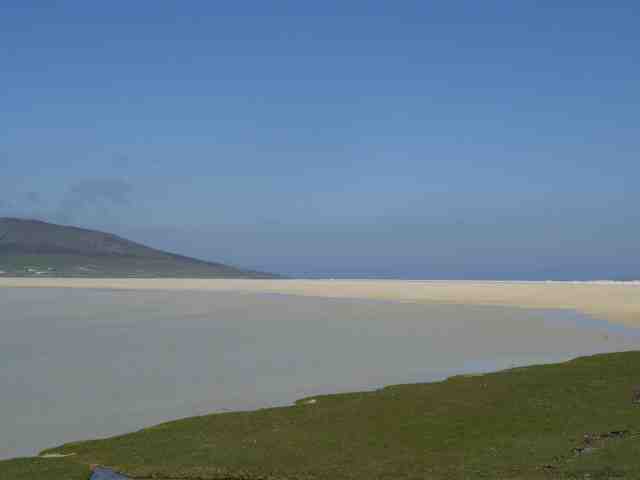 We continued along the main road and eventually entered Harris. What? Someone has definitely moved Harris - we are on the moon! Not only that: we are on the moon with water and sun. We even have to test the van's air conditioning. 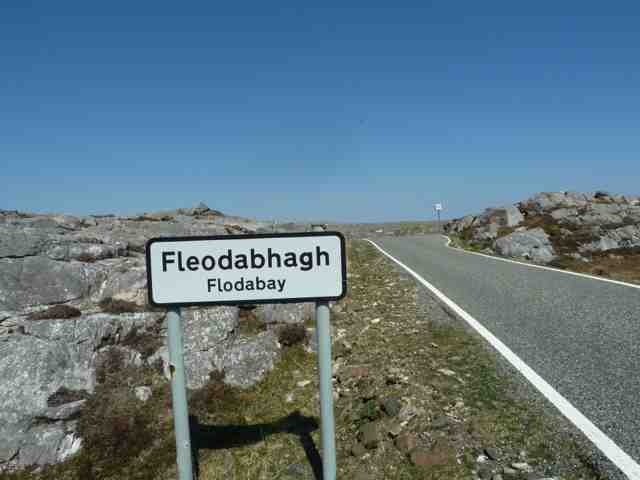 Roads in Harris are mostly single track with passing places-then as we turned off on to the C road heading for Flodabay the fun begins - these are not wide roads. An almost white knuckle drive where sometimes passing places have sheer drops beside them leads us to our campsite for the next 2 nights. The scenery was so lunar like in appearance -we were not surprised to hear from our campsite owner that scenes were filmed here for the film 2001- A Space Odyssey. Rather bleak rock and bog areas interspaced with fresh and seawater lochs. The sun was shining and the landscape looked stunning but in rain and wind the picture would be grim. Below shows the top of Rex at the campsite seen from the main road below. Sheep feed on this grass! As ever the best grass is nearest the road, and sometimes the road is nice and warm. Nice to lay down on, especially the black bits - away from the white lines. Our site is a small affair with spaces for 3 vans. 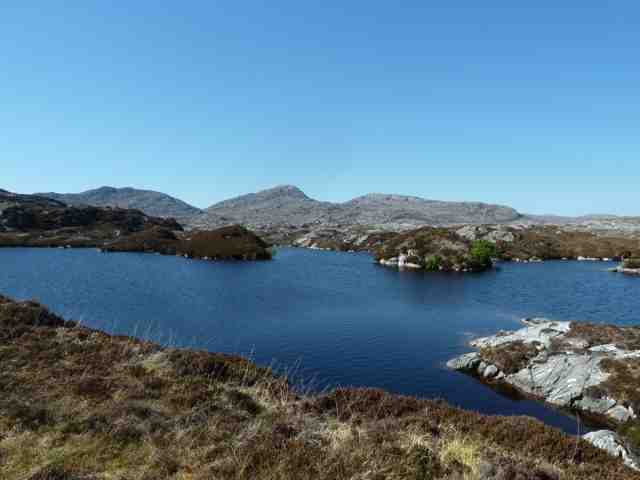 We imagined we were to be by the loch shore but in reality we were high above the loch in wilderness or so it seemed! We soon warmed to our pitch literally as the sun shone and our views were stunning. We decided to go for a walk to a nearby loch with an otter reported to be there -allegedly- we didn't see the otter - we discovered later we'd gone to the wrong loch! Carol managed to slip and fall into the wettest part of the bog on the way which provided a little drama! If anyone is passing we can recommend this site (in the sun anyway), Tony the owner does sausages and bacon from his (ex) pigs, fresh eggs, smokes his own caught fish, bakes his own bread and whatever else you name it. As Tony used to be a chef it is good stuff. Also stunning was the view of the Isle of Skye seen across the Little Minch with the flat-heads (on the left) and Cuillins to the right (out of picture) clearly visible with snow on the tops. 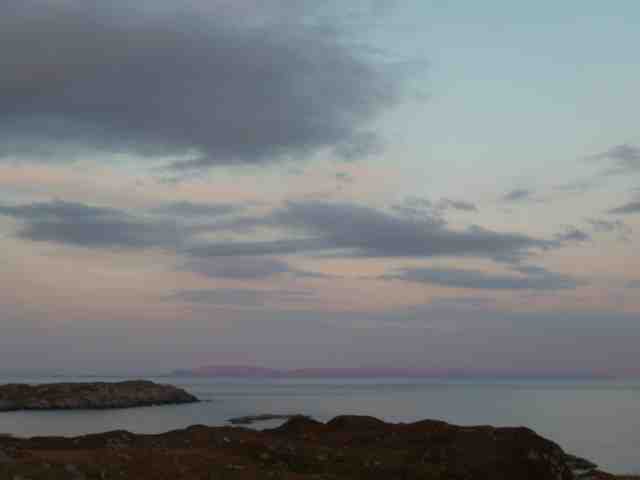 As the sun went down the Isle of Skye appeared to turn pink in contrast to the bright blue of the sea - Carol took some photos -but could not replicate the true beauty seen by the eye! Another magical moment. Today had we had the luxury of a lie in and a lazy start to the day. The days are long up here in the North with the sun rising early and not setting until 10pm. Woke to brilliant sunshine - hurrah! Peter and Valerie in the other campervan parked nearby were cooking (Tony's) bacon-the smell was fantastic. We resisted and ate our usual healthy fruit and yogurt and tried not to drool to much. Maybe some pig products tomorrow. They are touring Scotland the same as us but taking 2 months! -however they say they took a week to drive up from Kent so are taking it a little more leisurely than us. We decided to go by Graham's favourite propulsion method (pedal power) today and cycled a few miles back along the road we had driven along yesterday stopping off to view the scenery along the way. Sun, Moon, Bikes: Life doesn't get much better than this, especially mid-week! We took lunch at a lovely cafe/arty gallery called Skoon in a place called Geocrab (we thought it was a crab hatchery but it's actually a place name!) - amazing to find such a place in the middle of nowhere - a lovely building with views of a loch. After a leisurely cycle back up hill (for those of us with an electric bike) and down we spent the rest of the day relaxing by Rex and enjoying the sun. We even had a van prepared cream tea -bliss! We then walked to see if we could see the otter in the correct loch which although beautiful did not deliver on the otter front! The female otter swims down to the sea for hunting and brings the food back up to the loch for the cubs, so she is either out for a while or in for a while, which is not good for us tourists. Birds Spotters Corner: Buzzard - Looking down on it soaring below, magic! Hooded crows, Grey Herons, and of course, cuckoos - they seem to be everywhere on Harris. 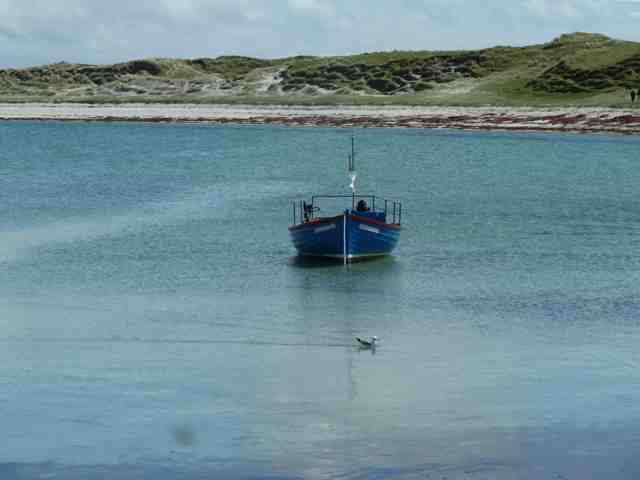 Tomorrow we travel to North Uist. Rating for Flodabay Farm - 9/10 - a unique site- just 3 pitches in an amazing setting-wild camping with electric and fresh farm produce! Tony and Sharon could not have been more welcoming. Although initially sceptical because of the exposed setting we loved it! Aimed to set off this am at 10am -managed 10.45 -not bad! 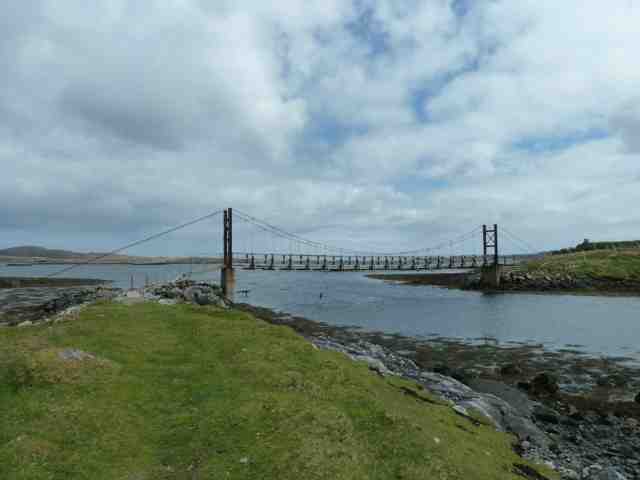 We travelled to Leverburgh to we catch the ferry over to Berneray across the sound of Harris and then on to North Uist. Fridge stocked with Tony's smoked salmon and cumberland sausages. 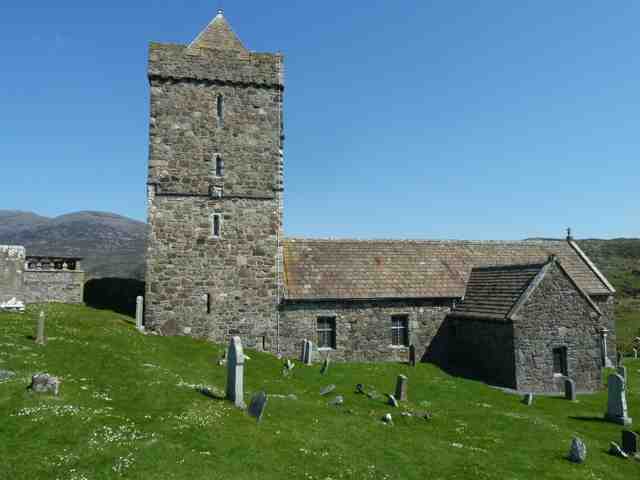 We stopped off in Rodel to see St Clements Church, burial place of the MacLeods of Harris and Dunvegan of Skye. The church was built in the pre reformation era -1520's hence it's tower -saved from ruination in the 18thC and fully restored in 1873 by the Countess of Dunmore. It is set on a grassy hill overlooking countryside with grazing sheep. We then travelled north up the west side of Harris in search of the famous glorious deserted beaches as we had time to kill before the ferry. We now know why the beaches are deserted - you can't get down to them. Most are fenced off and with no parking access is severely limited. Fences were everywhere on Harris. We are told it is to keep the sheep out, as sheep have right to roam. If you don't want them in your garden, house or car, it is up to you to put the fence up. After a quick photo shot we retraced our tracks back to Leverburgh to await the ferry. This is a "trapped" lake. Sea comes over the beach at high tide and is then stranded. The sea is on the other side. We enjoyed the ferry crossing in the sun - the ferry has to do slalom like manoeuvres to avoid numerous hidden rocks in the Sound of Harris - apparently one of Scotland's most tortuous routes-the Calmac Ferry made it look easy! We drove over the link road from Berneray on to North Uist and set off for our campsite set within the Balranald RSPB reserve. The scenery was certainly flatter and greener than experienced in Harris-also the beaches were extensive -difficult to differentiate between the silvery sea and the sand stretching out for what appeared to be miles. Following our Rough Guide book we decided to travel "a couple of miles down the road" past Balranald to the Hebridean Smokehouse to purchase some fish for dinner. 6 miles later we asked a local who said "keep going it's just over the hill". Another mile or so we found it. Note to self: 2 Rough Guide miles = 8 road miles. We hope the smoked sea trout is worth the mileage! Graham's bird spotter's corner - New birds spotted today were (by accident - I was driving not looking): Pink Footed Geese. I've seen these before on local reserves but never thought too much of them as to me they looked just like greylags, but close up, without binos, their feet really are very pink. A chill day. With mediocre weather promised and views of a field we have a lazy start and then go for the RSBP trail walk. Wow! What we thought was a sandy field was actually the edge of a beach, a headland and another even bigger beach, all in an RSPB reserve full of nesting sea and wading birds. Now, this walk could be boring unless you're into birds but for one of us it was just great. The day alternated between bird watching and examining bird books and to cap it all it was in the sun too. The site even had internet so Carol could download some (non-bird) books on her kindle. (Game of Thrones!?!). 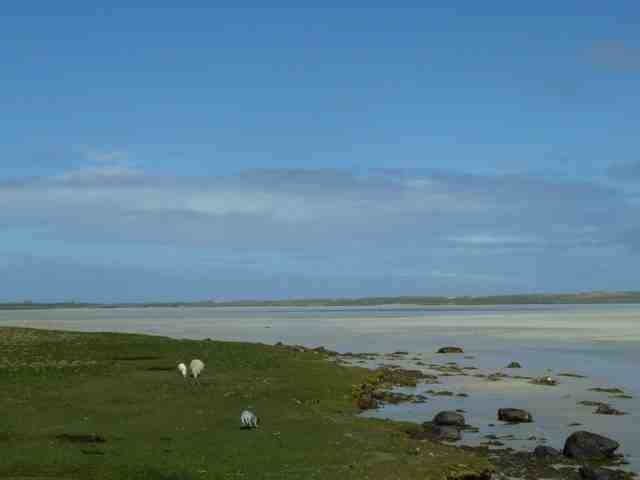 One of the beaches. There really is no need for the gillet - it is warm. 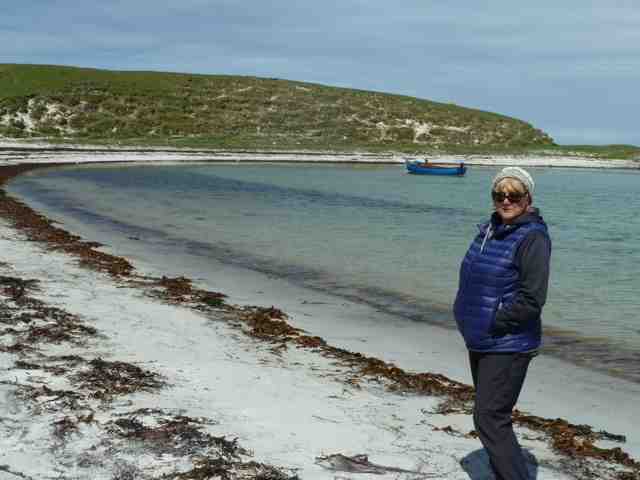 Another non bird photo -Carol was fascinated by the Machair - the grasses and plants growing in the sand beside the beach-This part of Scotland has 70% of all the Machair in the world! 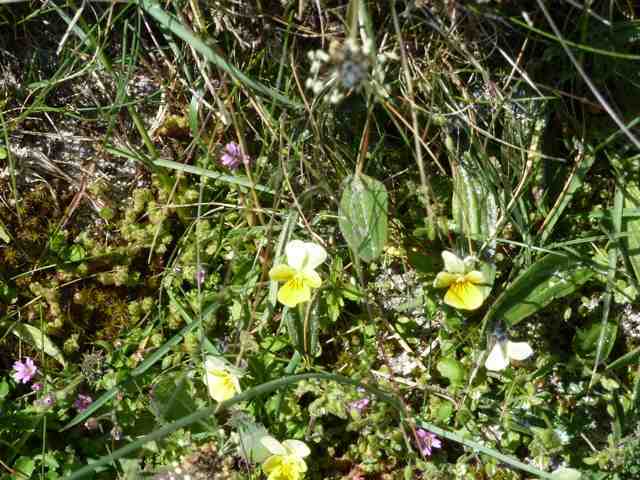 Here you can see tiny wild pansies and other teeny little flowers.The best time to see it in full flower is end June/July apparently-bet it looks a picture! 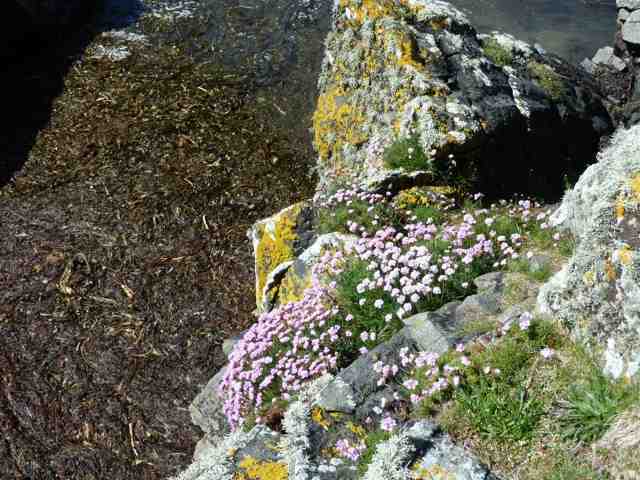 Also covering the cliff tops were what looked to be miles of daisies. Carol"s off to buy a book on Botany asap! 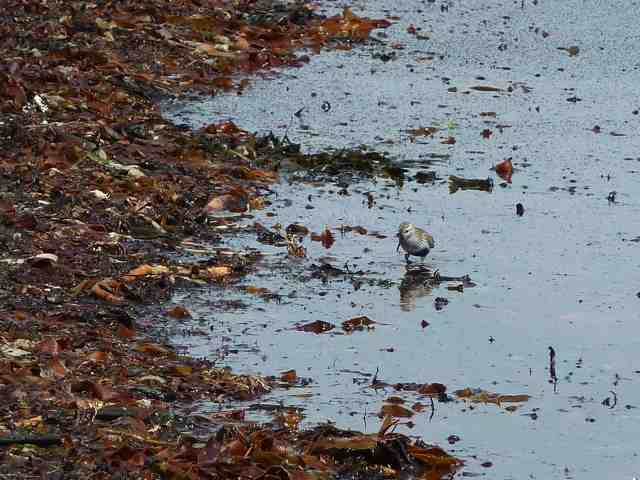 Dunlins, Oystercatchers, Sanderlings, Lapwings, Turnstones, Snipes, Arctic Terns and Wheatears. I know I've mentioned Arctic Terns before but they are fast becoming my favourite; swooping over the water, hovering like a kestrel and then diving vertically for fish - I could watch them all day. 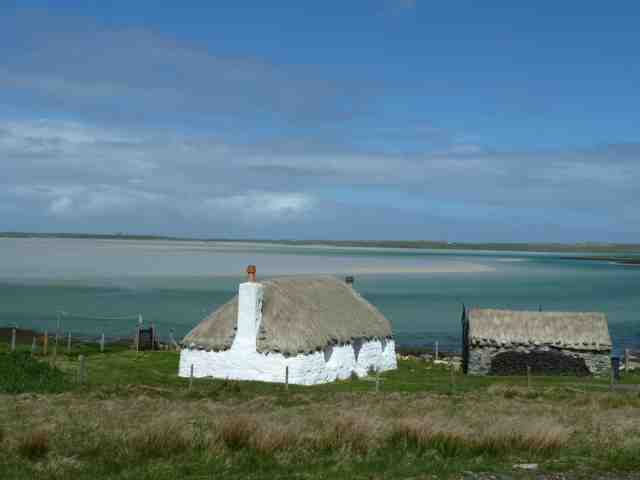 Rating for Balranald Hebridean Holiday site -8/10. Clean shower facilities. Uninspiring location in a flat field -the beach however was just a minutes walk away! Day 18: First of June: White Rabbits! Woke today to pouring rain- so had to cheer ourselves up with a cooked breakfast! With time to kill before catching the ferry to Skye late pm we headed back (the couple of miles) to the Hebridean Smokehouse shop and Carol bought a few tasteful souvenirs. We then drove leisurely to Lochmaddy - the views were amazing -so many extensive beaches with vivid green sea contrasting with the white sand. 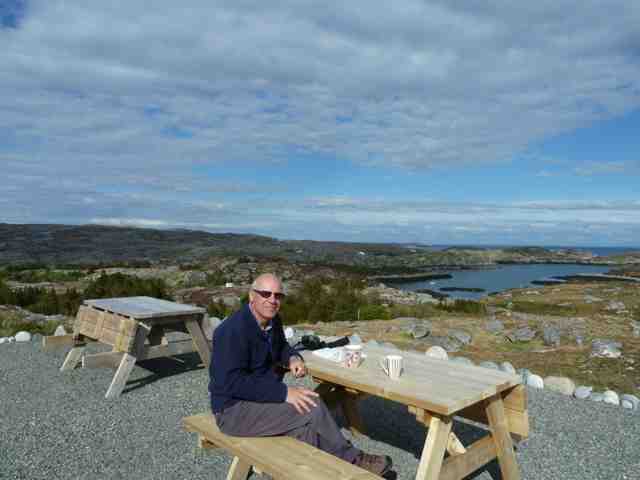 In Lochmaddy we visited the excellent visitor centre/museum/cafe where we had very tasty cake and coffee. There was also an exhibition of BA students art work - predictably the art we liked best had been sold-phew! We then walked just over a mile to a community art sculpture - "the hut of shadows". 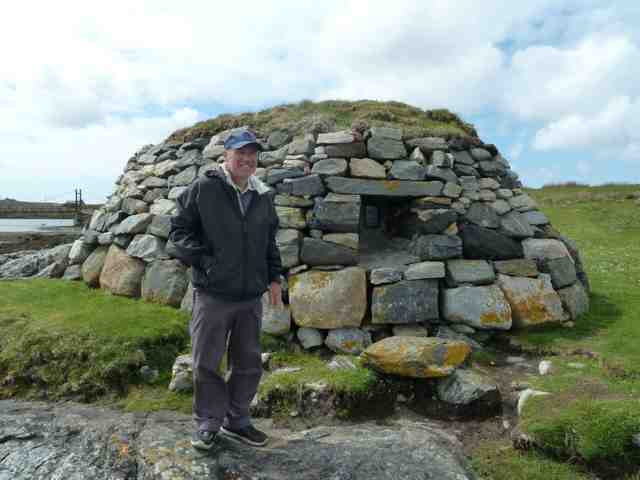 This was a stone built hut like building with a camera obscura projecting the view of the sea and landscape on the walls of the dark inner wall of the structure. Needless to say Graham struggled to see the art within! To get there we had to cross what appeared to be an early prototype for the forth suspension bridge! Back for further coffee and cake -we like to think we are contributing to the local economy. Graham outside the " hut of shadows" -the little gap is where the camera obscura is placed.You have to stoop to an almost crawl to get in and then adjust to the darkness to see the image. 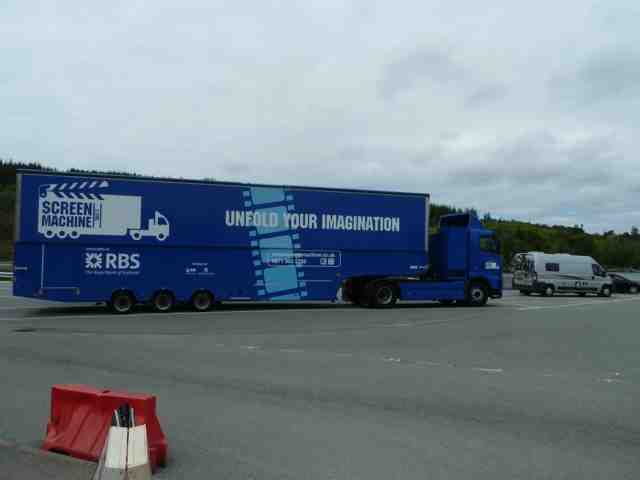 Then on to the ferry to Skye. We saw puffins,guillemots and gannets during our crossing -what a treat. 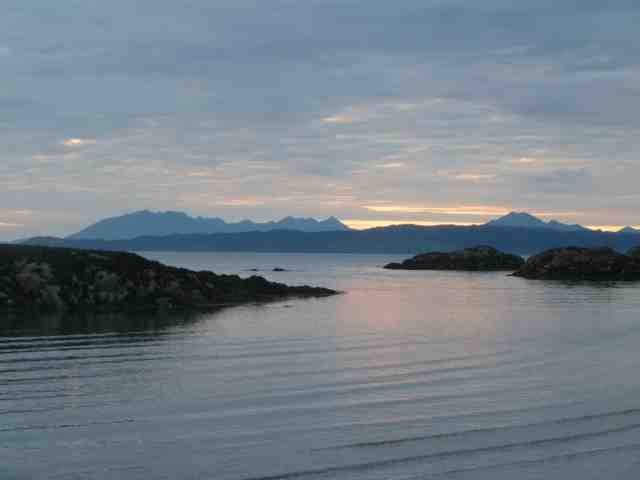 Tomorrow we head back to Mainland Scotland to Arisaig for 3 nights. 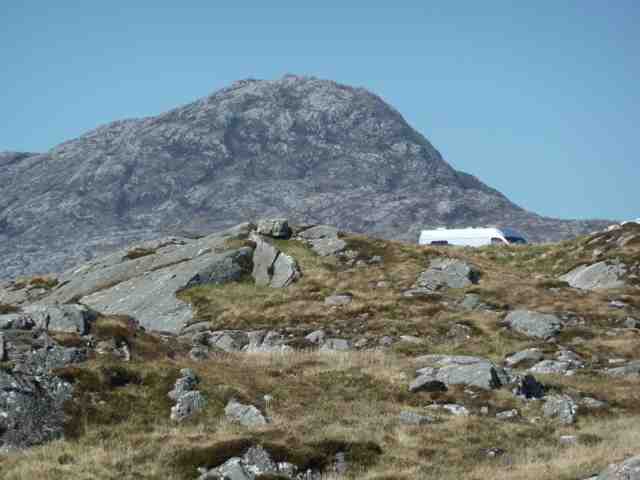 Rating for Torvaig campsite -8/10. (Ed. 6/10) Friendly owners. Clean basic shower facilities. Very sloped pitches -we were on a lean even with our chocks in place (ramps you drive on to to try to level the van). Also it was busy with not a lot of space between pitches - Dundee on one side, Poland on the next. Nice views of the Cuillins though in the distance-on and off through the mist. Day 19 2nd June - Still on Skye! A bit of a nothing day really! We set off for Armadale to catch the ferry with a stop over at the Aros Centre just a short drive out of Portree, and which has a live webcam link to a Sea Eagle's nest. There was an admission charge - something the RSBP almost never do and what a rip! The live web cam was down, the "audio visual" was a saccharine touristy advertorial film for Skye, and to cap it all was full of of New Zealanders talking to each other like they'd just met or something. Graham the "warden" (ie film projectionist) did give an interesting talk on identifying a sea eagle (i.e. it's big - very big). Sea Eagles used to exist in Britain and have no known predators except us; man, and we wiped them all out to hang them on our walls. Anyway, after a couple of attempts eaglets from Norway were re-introduced and we left happy in the knowledge that there are now 60 pairs of sea eagles in Scotland and they are now self-sustaining. Off the main road to Armadale (the ferry), Skye revealed a nicer side; less traffic, proper road surface, a nice, relaxing drive. We looked forward to the renowned Clan Donald to take in the magnificent gardens and a nice lunch. However, several coach-loads of French tourist just beat us to it and reserved the whole restaurant (sorry, no room but they won't be long, only an hour - you know the french and their lunches). Coffee and eat-ups in Rex again and then on to the ferry terminal. 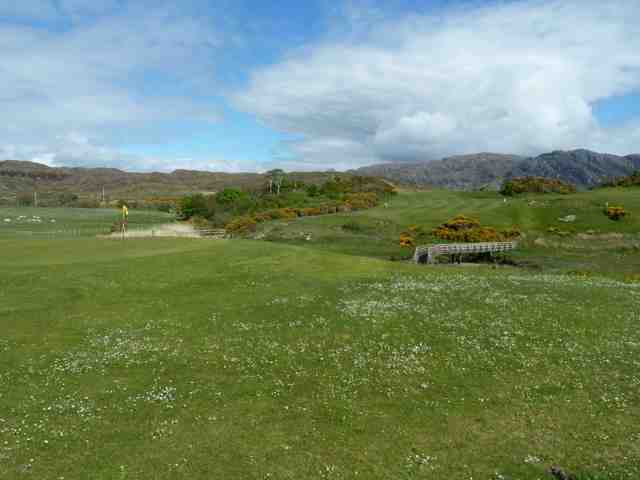 A short drive from Mallaig took us to Sunnyside Touring site near Arisaig: our base for the next 3 nights. 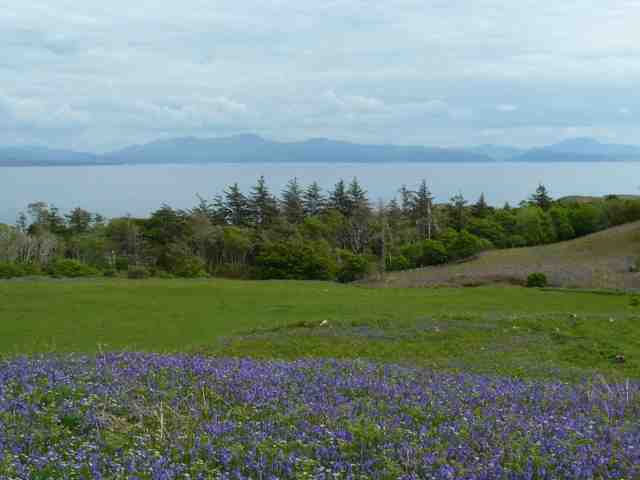 Our pitch has great views to the small isles. 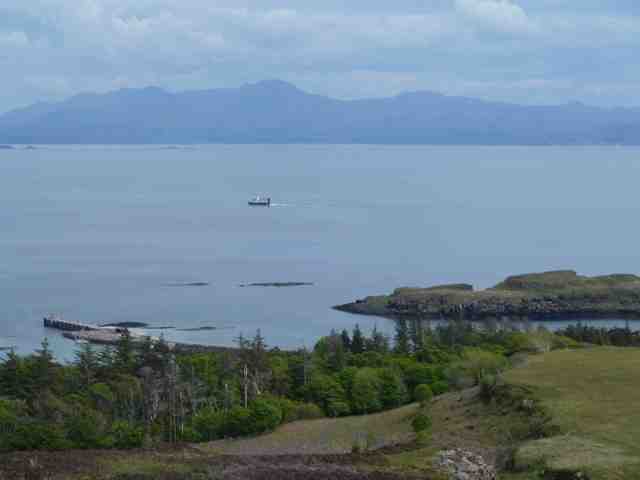 Graham decided to cycle around Arisaig for an explore. I love this place! (Graham) (thank god! Carol) The village has two restaurants, a Spar, lots of yachts in the bay, the sound of sheep, the usual birds and, of course, cuckoos, the only soundtrack - the perfect antidote to Skye. Later we walk up to the nearest hotel for our evening meal, a power cut means half the menu is off but everyone gets fed and is happy - and the walk back is glorious - sunset at half past ten! Today started misty and then we had sun for most of the day. Taking advantage of laundry facilities we walked to the nearest beach whilst we waited for the washing machine to complete its stuff. 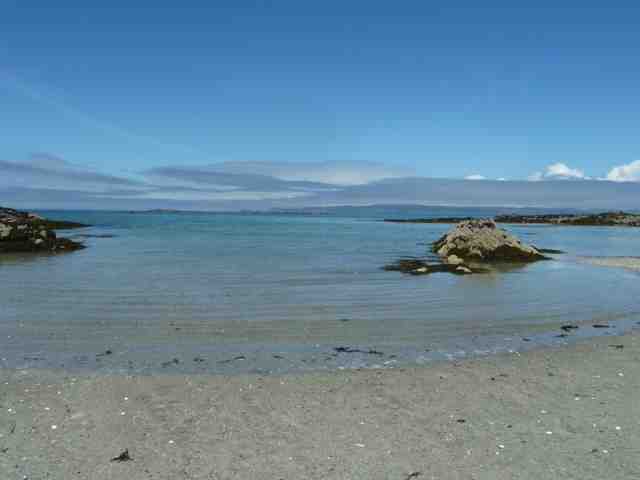 The site has almost private access on to the beach which was deserted for quite a time as we walked along it. White fine sand, rock pools,clear blue sea and views of the small isles (Eigg and Rum) and Skye - what a perfect combination. Are we in the Bahamas? 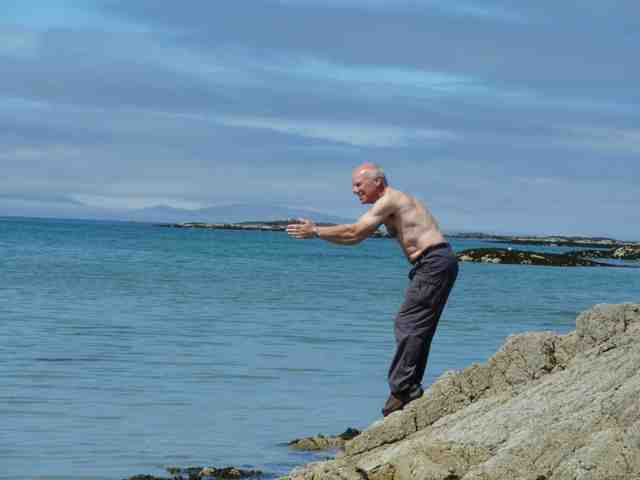 Not sure anyone wants to see me with my top off anymore - so look away now. After a while Carol goes to check the white goods so it's just me and my new friend; throaty. (Well it is her beach, or access anyway!) 5 sheepdogs and 2 jack russells ball chasing in the sea. The JR's don't stand a chance so they've developed this technique of jumping up to grab the ball before it is hurled into the sea. Two of the dogs patrol the path down to the farm for which there is a strict 10mph limit. If any vehicle travels at more than 10mph the dogs go barking crazy. At 9mph the head lifts but you're OK, but at 10mph you will get a stern telling off! After lunch we cycled to Morar approximately 6 miles north - where the famous beach scenes were filmed for the film Local Hero. 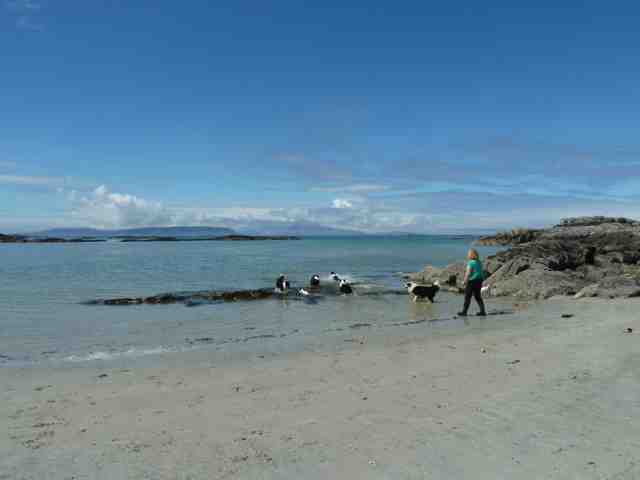 Morar is a lovely village with access to a string of stunning white sand beaches. It is also a stop on the way of the famous Jacobite Steam Train which travels from Fort William to Mallaig. We saw the train weaving it's way in the distance from our campsite earlier trailing its plume of smoke and sounding it's whistle. It's a train we want to travel on but at the moment we are at the end rather than the start. Throughout the cycle route we hugged the coast looking over beautiful beaches and magnificent views of the isles across the water. There is even a golf course - on this hole the fairway ends before the river, in all about 40 yards from the pin, so that would be interesting for visitors. This morning we cycled to Arisaig Marina in the hope there had been a cancellation on the boat trip to Eigg - and there had been! - our cup runneth over! Spent the 1 hour trip over on the Sheerwater motor boat chatting to fellow passengers. There was a party of 20 Finns dressed for some serious walking; boots, poles, rucksacks, who were heading for Eigg like us and a coach load of old people heading on to Rum. One of the finnish party particularly wooed the more elderly female passengers -allowing a lady to look through his monocular -stating the best thing was that the older lady could look through the lens with one eye and watch younger men with the other! -greeted with much amusement! We arrived on Eigg and spent a little time over coffee and cake (of course!) discussing our route for the day-we had 5 hours -now 4.5 hrs to enjoy a walking tour of Eigg. Following a locally produced guide we had a varied walk along the coast and edge of wood slowly climbing to the island landmark An Sgurr (1292 ft) which we can see from our campsite on the mainland. 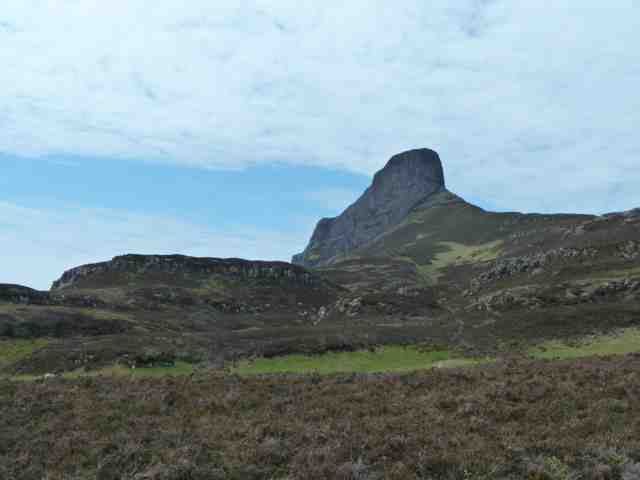 An Sgurr is eagle country, and looks it. Unfortunately for us it was just buzzard country. We then walked back to the pier through the grounds of the Lodge -the former laird's house -now a centre promoting green lifestyles. This was once a grand house and garden in it's time and although you can still get a feel of it's beauty, it appears rather neglected with shrubs leggy and fallen trees left where they fell. The population of Eigg bought the island in 1997 (following an unhappy history of private ownership) helped by donations from allover the world. Now, we may be wrong here but we felt a few of the Eiggans were just a tad lazy judging by the many cars with bumpers hanging off and the general air of inactivity and disrepair. If they're so green and living off the land, shouldn't they be repairing roads, mending fences and general maintenance while the weather is good? As to cars, due to the island being private there is no insurance, tax or MOT. Makes you wonder what happens when you want to put an extension on your house. After a 3 hour walk the liveliest place appeared to be the cafe/bar at the pier where we enjoyed a late lunch and a pint, noting that beer was the beverage of choice for the finnish contingent - who we sat near to and apart from our tea drinking compatriots! - in the spirit of european solidarity obviously! View of Rex from Eigg. 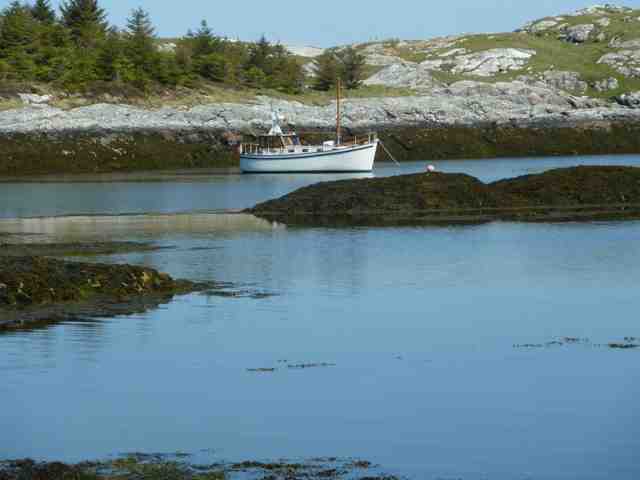 We enjoyed an uneventful passage back to Arisaig. Graham chatting to 2 local teachers - a music and a PE teacher who had travelled on the ferry to both deliver a 1 hour lesson to the 12 children of Eigg school. (Note: 4 hours travel there, 1 hour teaching, 4 hours travel back). Carol chatted to the loudest of the finnish contingent: "So did you manage to climb An Sgurr?" "No, why - we had a nice walk and drunk beer and wine and picnicked" responded the Finns. The discussion soon changed to whisky, scottish attractions, the price of booze in Finland and the EU - which caused the most heated of discussion! 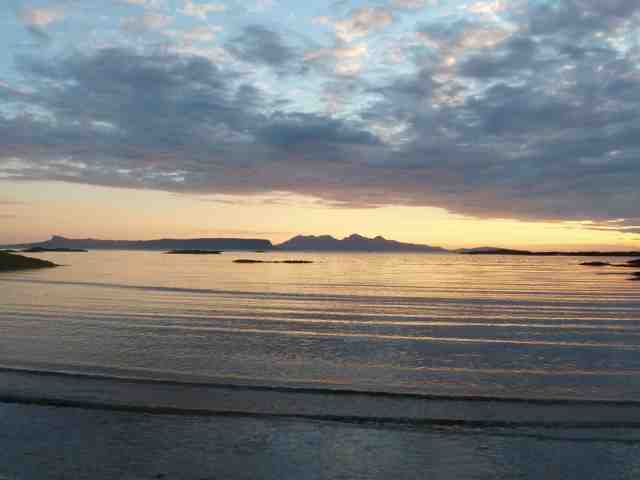 Last night at Arisaig. We love this place! Quiet, off the beaten track and the right side of Scotland for the magnificent views, but still not too remote. Skye and the Cuillins - still snow on but you need binos to see it. We fall fall asleep with Morcheeba chilling on the ipod. The perfect end to another perfect day. Tomorrow we travel to Oban and ferry to Islay.